The story of a tragic character (Judith Evelyn), a young-ish woman but getting older by the day. Known only as “Miss Lonelyhearts”, she paces her apartment, pantomiming the romance she desperately craves for. When she thinks she’s finally found Mr. Right, he turns out to have only one thing on his mind. Despondent and desperate, she almost does something terrible. But at the moment of truth, she’s stopped by the sounds of beautiful music… the lovely piano wafting through an upper window, belonging to a popular young songwriter (Ross Bagdasarian). 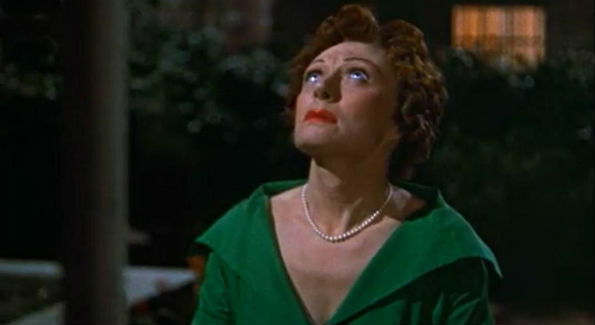 Hitchcock’s expert direction and a razor-sharp script bring this touching tale to life, with a heartbreaking performance by Evelyn. The film is given a strong sense of community coming to the rescue of the individual, with attention occasionally being drawn to a number of side stories. There’s the middle-aged couple (Sara Berner, Frank Cady), trying to cope with the stifling heat and the loss of a beloved pet. The lithe dancer (Georgine Darcy), trying to advance her career while fending off the advances of numerous suitors (her story has a charming twist at the end). The bitter jewelry salesman (Raymond Burr), trapped in a loveless marriage to a nagging invalid (Irene Winston). The steamy story of the newlywed couple (Rand Harper, Havis Davenport) enjoying an amorous honeymoon in their apartment. There’s also a small but memorable role by James Stewart as a nosy but concerned peeping tom, and keep an eye out for the marvelous Thelma Ritter. This entry was posted on December 9, 2012 at 5:03 pm	and is filed under Movie Reviews. You can follow any responses to this entry through the RSS 2.0 feed. You can leave a response, or trackback from your own site. This review had me smiling the whole way through (esp. at “There’s also a small but memorable role by James Stewart as a nosy but concerned peeping tom.”) A wonderful way to write about a movie that’s already had so much written about it. And it really does point out how full of character “Miss Lonelyhearts” is considering we only ever see her at a distance. This is definitely one of Hitchcock’s best, which of course means it’s one of the very best movies ever. The story of Miss Lonelyhearts is the most moving in the film and the one that always stays with me the longest. My review was tongue-in-cheek, of course, but there really is practically a whole movie in the Miss Lonelyhearts story. Thanks for reading and commenting!